Imagine: A category five hurricane strikes. You chose not to evacuate to protect your property, and to help others who stayed behind. While checking on one of your properties, heavily armed officers arrest you and three friends at gunpoint. They refuse to elucidate your charges, strip search you, and throw you in a torturous outdoor holding cell unfit for animals. You watch your captors as they torture fellow prisoners with pepper spray and beanbag guns for seemingly minor infractions. They deny your right to a phone call, medical treatment, and legal representation–violating your basic human rights. Your dignity evaporates along with your hope for release. 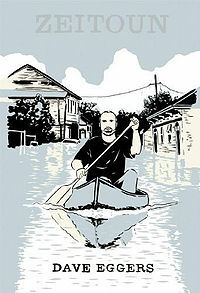 That’s what happened to Abdulrahman Zeitoun (pronounced “Zay-toon”), a Syrian American Muslim man, after Hurricane Katrina devastated New Orleans in 2005. In all, Zeitoun spent 23 days in jail. During his incarceration, he was never formally charged with a crime or allowed to make a phone call. While Zeitoun, a painting contractor, eventually restored the family home (it was flooded by Lake Pontchartrain when the levees broke after the storm), peace of mind, safety, and faith in the American government that was supposed to protect him, remain elusive. Eggers reports the story through the family’s eyes, based on their memories of the events and copious research. Where possible, news and government reports confirm dates and events. However, there is very little balance within the book—only two police officers’ limited accounts appear. Interviews with FEMA, police leadership, and government officials are absent. There is no question that what happened to the Zeitouns was nightmarish and horrendous. Unfortunately, the American government remains unaccountable for their failures post Katrina. But then again, with such egregious neglect for the health and well being of its citizens, could any explanation possibly suffice? All proceeds from book sales go directly to the Zeitoun Foundation, to help rebuild New Orleans and promote human rights for all Americans. Read what Wikipedia has to say about the book.